Preparations of pathological tissue show typical or unusual manifestations of diseases. 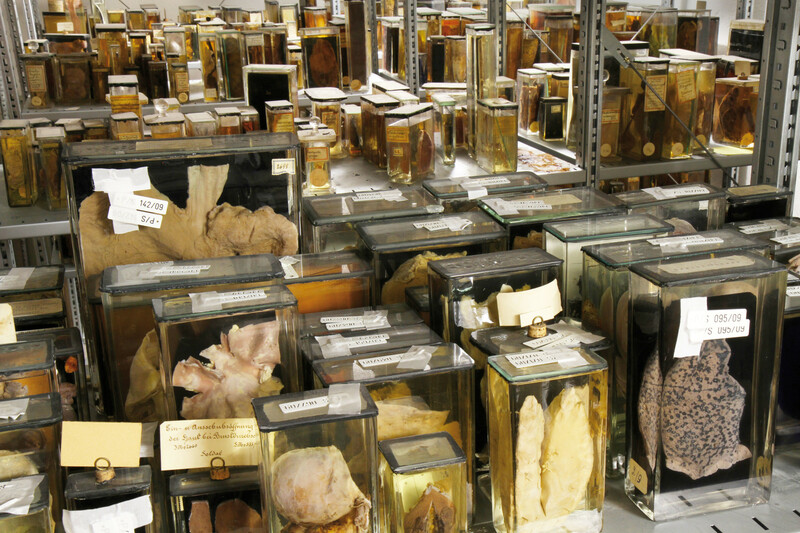 The preparations of diseased organs belonging to FAU were originally part of the Anatomical Collection. This dates back to the foundation of the University in 1743, when the first body was dissected and used for preparations just weeks after the University had opened. The preparations made into a separate collection in 1850, which became the property of the chair of pathological anatomy when it was established in 1862. The collection continued to grow until the 1960s, when it began to fall out of use in teaching and research as it was replaced by modern methods, and much of the collection was lost. It is only recently that parts of it have been rediscovered. Today the Pathological Collection still has around 1200 wet preparations, most of which are over 100 years old. The artefacts that were in the worst state have already been restored. It is currently being catalogued so that it can be used again in the future as a reference for teaching in medicine and as a historical source. Visits can be arranged for research purposes.